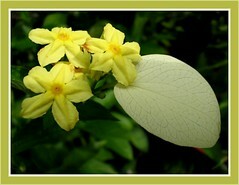 Common Name: Dwarf Mussaenda, White Wing, Dwarf Yellow Mussaenda, Miniature White Flag. 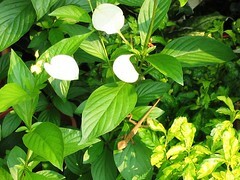 Plant type: Tropical perennial shrub, native to Tropical Africa, Asia and Malaysia. Moisture: Needs moderate water regularly but do not overwater. Soil: Grow best in well-drained loamy soil. Propagation: From softwood or semi-hardwood cuttings, air layering and from seeds though rarely available. Features: Mussaenda luteola, a dwarf species, is quite an eye-catching flowering shrub reaching a height ranging from 2 to 3 feet, erect, small in stature and more compact in habit than the typical Mussaenda flag species. Leaves are bright green, lanceolate, 2-5 inches long and prominently veined. An all year round blooming shrub covered with flower clusters borne in branching terminal, trichotomous corymbs. Flowers are composed of small bright yellow, star-shaped corollas with orange centres and subtended by the palest creamy yellow or off-white enlarged sepals (bracts) that resemble white wings or flags. Usage: Being small and ever-blooming, Dwarf Mussaenda will be excellent for container gardening or planted en masse in a border or used as hedges. 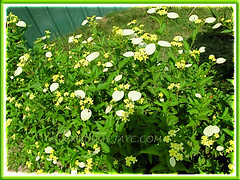 Great for landscapping as a single decorative specimen or in a group of low-growing plants in home gardens or parks. Attractive to butterflies, bees, hummingbirds and insect pollinators as a nectar plant. Care: Dwarf Mussaenda loves hot and humid environment, so locate it where it can receive full sun to induce continuous flowering. 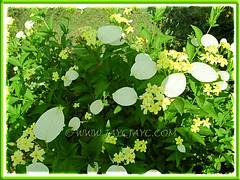 Prune after blooming to shape and get a bushier shrub with more branching, resulting in more flowers. It has a tendency to become straggly and leggy, so prune heavily which it can tolerate, if necessary. There are no known serious insect or disease problems but do watch for spider mites and whiteflies. For temperate regions: It blooms especially well during the warm months but may need cold protection during winters. Peruse this informative fact sheet on Mussaendas from the University of Florida. To enjoy more Mussaenda images, go to TopTropicals.com and type the word – mussaenda, in the search box next to Plant Catalog at the top bar. Pseuderanthemum reticulatum (Yellow-vein Eranthemum) simply adores the sun! Hi! Just want to know where can I buy Mussaenda luteola? I am from the Philippines and I am interested to import rooted cuttings or plant. Thank you.